Amidala's Flower mini-quilt (28" x 28") Orignial, un-embellished version, designed for Island Batiks in the Empress Garden Collection, Spring 2017. See the fully embellished Amidala's Flower at the end of this blog. *Please be patient. This blog posts has lots of pictures, so may take a bit longer to load. 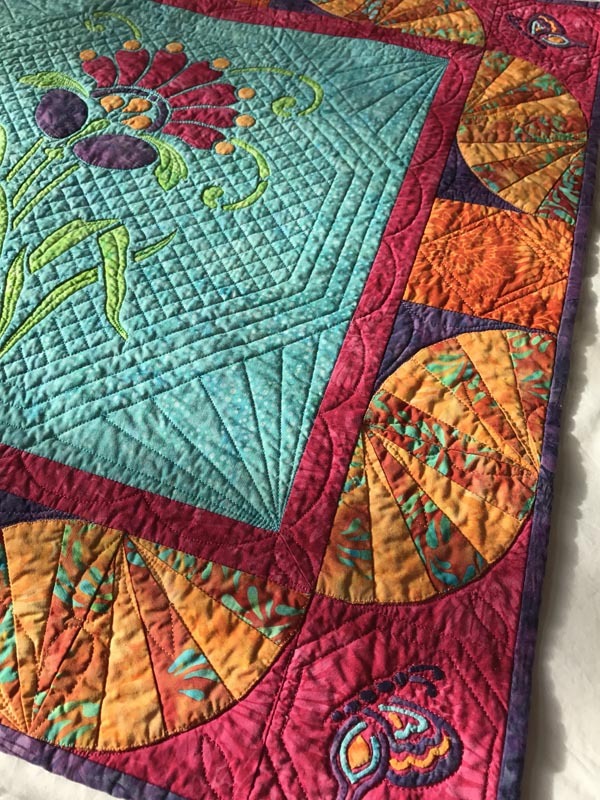 These bright fabrics from the Empress Collection by Island Batik inspired me to design and create this Fantastical flower mini-quilt, "Amidala's Flower" (28" x 28"). The pattern gives you directions for hand and machine reverse applique with added applique, and full size patterns, just like all our patterns. But then I got further inspired. For my second sample I was going to play with embellishments. I puffed the blossom petals with stuffing, embroidered and stitched the butterfly corner blocks, and added some Swarovski crystals. Not too many crystals, but just enough to catch your eye with a sparkle when the light is right. What follows here are the modifications to create an embellished version of Amidala's Flower. Make it as we have, or be inspired to embellish it in your own unique way. For the dimensionalizing of the Center Flower(18" x 18") and embroidering the butterfly corner blocks, I had to decide before I started that I was going to do this. I made my embellished version of Amidala’s Flower by hand. Indeed I don’t think some of these ideas would work if you are making the flower by machine. But perhaps you will learn different. I wandered Jo-Ann’s Fabrics, brainstorming as I wandered, for some embellishment ideas. I gathered an assortment to inspire me. Beads. Embroidery floss. Tiny buttons. Stuffing. I followed the pattern's directions for hand reverse applique ( page 2), and hand applique (page 3). I only wanted to puff the hot pink and dark purple petals. I stitched around 3 sides of a petal. Through the 4th side, I took a small bit of polyester stuffing, about the size of a quarter. I used my favorite bent-handled, blunt tipped Kai scissors, and pushed the stuffing into the petal. Then I continued to hand stitch the petal closed. A quarter size bit of stuffing. Using Kai scissors to puff the petal. Stitching closed the last side. Original all appliqued 4" butterfly corner block. Most of the applique was 1/8" or less. The Butterfly corner blocks are quite small, finishing as a 4” block. The butterfly wing fabric sections were often 1/8” or less. Let's try some embroidery, I thought. That would be fun and add interesting texture. I learned to embroider when I was 10, but hadn’t embroidered in years. I still wanted some applique, too, so, I decided to applique the largest butterfly wing section- the purple, and then embroider the rest of the butterfly wing bits. I also decided that I wanted to create the antennae and butterfly body with embroidery and crystsals. Hand needle turn applique of purple Butterfly wing. I used DMC embroidery floss. The turquoise is #597, the golden orange is # 741, and black for the antennae. Following the directions for Applique Butterfly Blocks on page 3 of the pattern, I traced the whole design onto the wrong side of the pink background square. Next I appliqued on the purple wing bit. Time to embroider my turquoise wing bits. I divided my embroidery thread so I had 3 strands threaded on my embroidery needle. From the wrong side, I basted the outline of my turquoise wing bit. I then moved onto the next turquoise wing bit. Basting outline of turquoise wing bit. Satin stitch perpendicular to outline. 1st turquoise wing bit done. 2nd turquoise wing bit done. Next I outlined and satin stitched the golden orange wing bit with #741 DMC Embroidery Floss as I did the turquoise. Outlining the golden orange wing bit for satin stitch. Satin stitch of Golden orange wing bits. I wanted to create the butterfly body and antennae tips with beads, but embroider the actual antennae. Working from the back, where the pattern was traced onto the fabric, I did a stem stitch for the antennae. 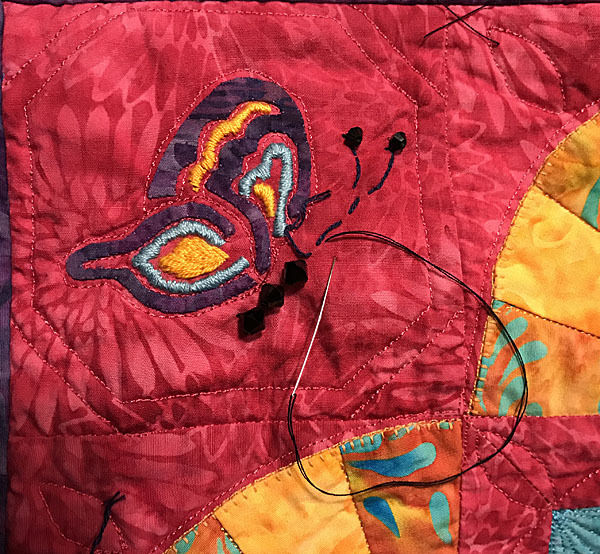 When quilting and beading, the beads aren’t stitched or glued on until the piece is layered and quilted. But I needed to “mark” the place for the beads. So, I did a rough running stitch to tell me where I was going to put the beads for the body. The embroidered antennae would tell me where to place the antennae feeler tip beads. Antennae created with stem stitch. Running stitches as place-holders for the future Body beads. Once my center flower was stitched and puffed , and the butterfly corner blocks were appliqued and embroidered, I could continue to create my Amidala’s flower quilt top. I returned to my pattern's directions to finish the top. I constructed the fan blocks, cut my inner border and Dark orange squares, then stitched it all together. .Next I layered the piece with my batting and backing and machine quilted it. For me, the quilting is also part of the embellishment. It adds texture and dimension. I quilted in the Green leaves and stems to make the reverse appliqued negative space recede. I quilted in the ditch around the puffed applique to make it pop off the background even more. I decorated the turquoise background with a 1/2" grid and frame to set off the flower. And finally, I added stitches to not only hold the inner and outer borders secure, but to frame Amidala's Flower into a whole. See pictures below for more details. Quilt in the green reverse applique space, in the ditch around the applique petals, and a 1/2" cross-hatch and frame. A better view of quilted Cross-hatching and frame, plus a scallop for the inner border. Used pounce pad and #30692 Score of Four stencil for quilting the fan border blocks. Quilted in the ditch around the butterfly wing bits and an octagon around the butterfly corner blocks, and a diamond in the dark orange squares. My Swarovski crystal beads for embellishing. These are the packs I bought at JoAnn's Fabrics. Finally, it was time to play with buttons and crystals. I auditioned both my buttons and crystals, and decided not to use the buttons. I liked the fanciful quality of the crystals. They were a subtle touch that caught the light and drew you in to see what was going on in the piece. I chose crystals that required me to sew them on, but I'm sure you could also use glue on crystals. I threaded my No. 11 Milliners, my applique needle, with thread that matched each of the crystal colors. I stitched only on the top of the quilted piece, keeping my knot under each bead. I had a dark orange crystal and what looked like a pale peach crystals for the orange appliqued circles of the flowers. After experimenting, I settled upon the pale peachy beads. It was a subtler effect. I had a small and larger size of the black crystals for the butterfly body and antennae tips. I stitched on six larger crystals for the butterfly bodies, removing the place-holding running stitches as I went. At the ends on the antennae I stitched a smaller bead for the antennae feeler tip. Adding Body beads and removing place holder stitches. Larger beads for the body, smaller beads for the antennae feelers. I approached my pink petals with an open mind to experimentation. One bead per petal didn’t seem enough, yet creating long veins on each petal seemed too much. So, I started in the middle and fanned out, echoing the fanning of the petals. I stitched 4 crystals along the mid-line of the middle petal. On the next one on each side, I stitched 3 crystals. Then 2 crystals, and finally on the outermost petals, only 1 crystal. Beading the pink petals to create veins. I had 5 pink crystal left, and decided to stitch 1 onto the base of the middle bud petal. This gave a touch of sparkle in the lower left corner of the piece. This left me with 4 pale pink crystals to play with. 1 Bead on the bud. The darker orange beads that I originally bought for the orange appliqued circles were in their bag unused. 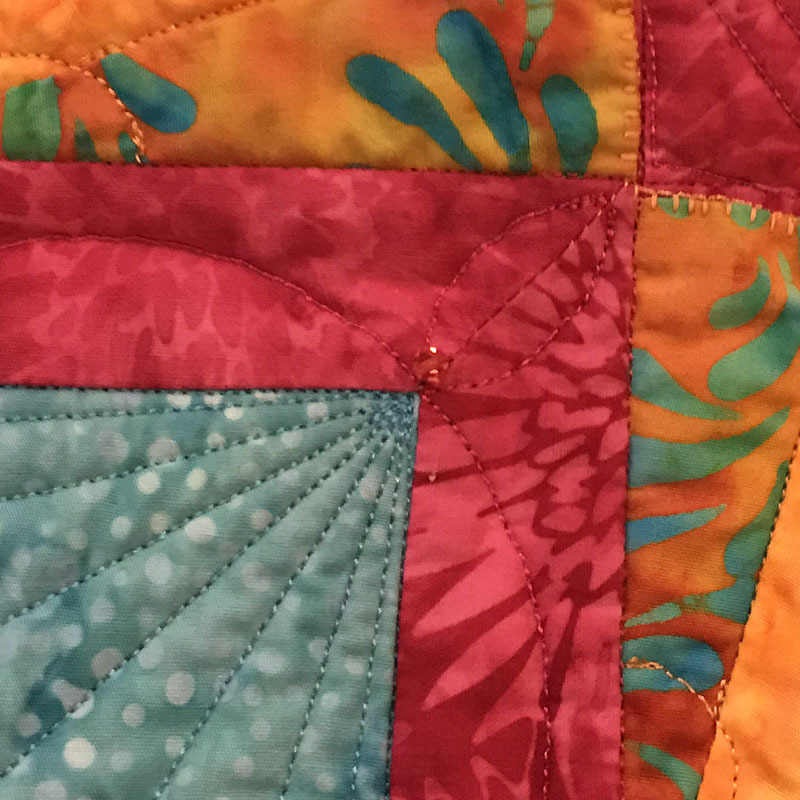 As I looked at the piece I decided they would add a touch of sparkle in the center of the orange quilt blocks in the border. I had 4 pink crystals left. I lay one in the corner of the sashing, and thought that would also work. So I stitched those four crystals on, one in each corner. 1 Pale pink crystal bead in each corner of the inner border. I was satisfied. And it was a fun creative endeavor! Unfortunately, it’s very difficult to take a picture that shows all the elements that I took time to add into my embellished Amidala’s Flower. But, when you see it in person, you will catch a glint of light and wonder what you just saw, drawing you into this Fantastical flower for the Princess in You.